Blog Sports Massage: Is It For You? Sports Massage: Is It For You? Sports Massage has gained great popularity among athletes and non-athletes alike, in the last few decades. Many of our massage therapists at Urban Sanctuary have listed sports massage as one of their favorite services to give. It is a very rewarding type of massage to give because you are helping to enhance what a person can do… The measurable results achieved are probably what is responsible for the big boom in requests for sports massage at gyms, clinics and spas. People love the connection between their massages and their ability to stretch themselves further on the field, the court or wherever they may be. There is some debate in the massage and spa community about the exact definition of sports massage partly due to the fact that there is a lot of overlap in technique between sports massage, deep tissue massage, and several relaxation massage modalities… Stretching, compressions, trigger point work, positional release, myofascial release, efflerauge and many other techniques may be incorporated into your sports massage regimen. The techniques vary according to the purpose of the massage, the preferences of the client, and the style of the massage therapist. The easiest way to distinguish sports massage from other types is the goal of the massage rather than the techniques used. We define sports massage as a very directed style of massage aimed at preparing the body for an event or activity, recovering the body from said event, or maximizing results during physical training periods. Pre-event sports massage is the most distinctive from other types as it involves lots of pumping, rocking, and invigorating motions to get the body energized to perform. Pre-event sports massage often happens on location, and focuses on getting the body warmed up and limbered up for maximum performance. Time is spent lightly addressing injuries like tennis elbow or frozen shoulder, but very deep and painful techniques can take away from performance right before a big swim or game. On location, a pre-event sports massage might be as short as 10-15 minutes, depending on the athletic event. Swim coaches at a recent college swim meet (Urban Sanctuary Massages at SEC Swim Meet) set the parameters for Urban Sanctuary massage therapists when they provided 20 to 30 minute massages for the divers and 15 minute massages for the swimmers. Pre-event sports massages also happen the morning of, or the day before, an event. In this case, the massage can be a little mellower and a lot longer than 30 minutes, still focusing on limbering up and preparing the body. The additional massage time addresses potential problem areas, which might impede performance. Whether off location the day before, or on-location before a match, pre-event sports massage helps muscles achieve their best. Post-event sports massages are given after the event to help the body cool down, repair, and recover. Massage reduces recovery time from strenuous activity and over-exertion. After pushing your body to the limit, massage given on-location or at the spa eases soreness and stiffness. Light stretching and long gliding techniques flush out excess lactic acid, reducing the after-game soreness and cramping. The day-after sports massage can be very beneficial in helping to normalize the body’s tissues, reducing shock and bringing the body back to homeostasis. 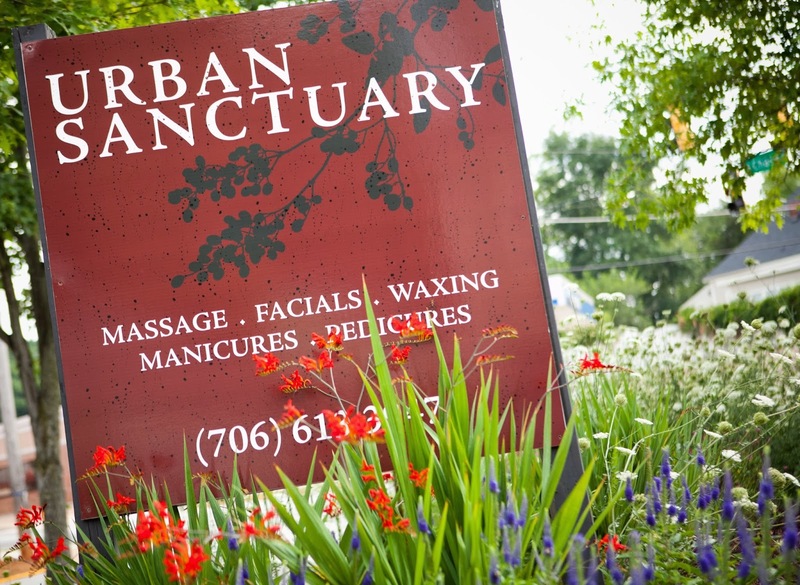 At Urban Sanctuary, we often give massages on Sundays and Mondays to help our clients re-coup from a weekend 5k or marathon. On-going sports massage is very useful in improving results achieved during training periods. Great candidates for this include dancers who perform or compete, weight trainers, marathon runners, long distance walkers, hikers, tennis players, skiers, people on a fitness program, people new to a recreational sport, seasoned athletes, and college athletes. Many of the weight trainers who come into Urban Sanctuary for massage have reported that their massages allow them to train harder. Massage benefits anyone who pushes his or her body over time by increasing proprioception. Increased proprioception & body awareness play a part in preventing missed steps & injuries. Sports massage incorporates many techniques to relieve pain, break up scar tissue, increase range of motion, and decrease stiffness. Available at many spas and massage clinics around the US, sports massage styles have a great range. The most important thing for a successful sports massage is good communication with your massage therapist about how you feel and what you need. Although originally developed for serious athletes, sports massage is now a favorite for lots of folks who enjoy being active. It’s a nice reward after a job well done. Candice Courcy – In Arizona, Candice enjoyed working with tennis professionals and rock climbers weekly. Candice ran a massage room for Urban Sanctuary at a local weight training gym called Athens Personal Fitness. She has worked in the spa industry for over 20 years as a massage therapist, instructor, consultant, and spa owner.